Senior politicians in Germany have expressed outrage that the mayor of the eastern German town of Troeglitz was forced to resign after local authorities failed to stop a protest by the far-right National Democratic Party (NPD) outside his house. 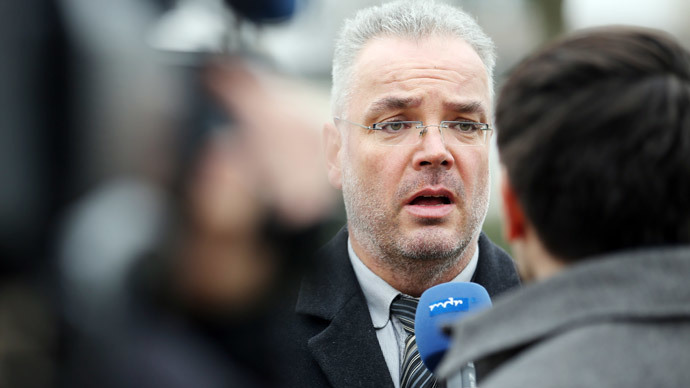 Markus Nierth, the elected mayor of Troeglitz, said Monday that he had resigned because he feared for his family’s safety after the NPD was allowed to hold a rally outside his home to protest against his plans to house asylum seekers in the town. It comes as the far-right continues to gain support across Germany amid an increase in asylum seekers. The number of asylum seekers in the country jumped 60 percent last year, according to the Federal Statistics Office. "It's about my children and my wife fearing the arrival of truckloads of neo-Nazis...their kind, peaceful faces looking through our windows and...letting us hear their loving slogans," Nierth wrote on Facebook. Cem Oezdemir, co-leader of the Greens, used stronger words. “If an elected mayor does not feel protected from a brown mob in our democracy, all alarm bells must be ringing,” he said, referring to the brown uniforms of the SS under Hitler. The problem of immigration into Germany has been highlighted in recent months by the anti-immigration group PEGIDA (Patriotic Europeans Against The Islamization of the West). The group has held several demonstrations in Dresden and has been fueling anti-Muslim sentiments in the wake of the Charlie Hebdo terror attacks in Paris. While polls show that Merkel’s government is not paying enough attention to people’s worries about immigration, Germans have also been embarrassed by the anti-immigration tone of PEGIDA. There have been a number of counter-demonstrations against the group across Germany.